The gold price added to the day's gains on Wednesday, after a decision by the US Federal Reserve to continue reducing asset purchases under its economic stimulus program at the same rate of $10 billion a month. On the Comex division of the New York Mercantile Exchange, gold futures for February delivery – the most active contract – last traded at $1,265.20 an ounce, gaining shortly after the announcement and up more nearly $15 from yesterday's close. April gold also traded higher in heavy volumes with more than 230,000 contracts of 100 troy ounces for the two futures changing hands by early afternoon compared to a daily average of of roughly 170,000 contracts. The Federal Open Market Committee as widely expected announced a reduction of a further $10 billion to $65 billion a month of purchases under its quantitative easing program that has pumped $4 trillion of easy money into the US economy. The gold price has been moving higher in recent weeks on safe haven buying as emerging markets tumble and currencies crash, but the Fed in the statement at its first meeting for the year made no mention of the turmoil the stimulus cutbacks in the US have created in the rest of the world. Wednesday's meeting was last interest rate decision under Ben Bernanke, who now hands the chairmanship to Janet Yellen, Yellen is a strong supporter of QE and was one of the chief architects of the stimulus program, but more hawkish Fed members joining the committee had some speculate the taper could be accelerated. Charles Plosser, president of the Philadelphia Federal Reserve, recently said asset purchases should be wound down sooner than the end of the year, while Dallas President Richard Fisher said he wanted the taper to be double the size it was, that is $20 billion. The US has not been alone in printing money and together with the Bank of Japan, the European Central Bank and the Bank of England, more than $10 trillion of easy money is now sloshing around in the system. Monetary expansion, particularly since the financial crisis, has been a massive boon for the gold price. Gold was trading around $830 an ounce before Chairman Ben Bernanke announced Q1 in November 2008. 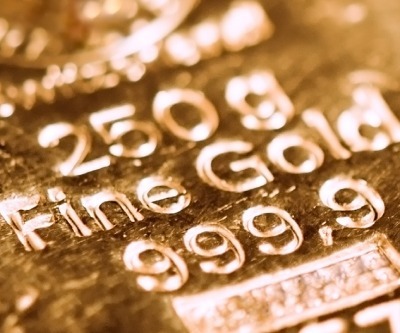 Gold and the US dollar usually moves in the opposite directions and gold's perceived status as a hedge against inflation is also burnished when central banks flood markets with money. The price of gold slid close to 28% in 2013 – the worst annual performance since 1980 – in anticipation of an end to the ultra-loose monetary policy, but the metal's perceived value as a safe have in time of turmoil has seen it gain 5% so far this year.